Ossuary of Caiaphas' Relative Declared Authentic. Israel Antiquities Authority announced today that an ossuary bearing the inscription Miriam, daughter of Yeshua, son of Caiaphas is authentic. Here is what the Huffington Post has to say. You can also read it about it at Ferrell Jenkin's Blog. JERUSALEM — Israeli scholars have confirmed the authenticity of a 2,000-year-old burial box that appears to bear the name of a relative of the high priest Caiaphas mentioned in the New Testament, the Israel Antiquities Authority said Wednesday. The find offers support for the existence of the biblical Caiaphas, who appears in the New Testament as a temple priest and an adversary of Jesus who played a key role in his crucifixion. 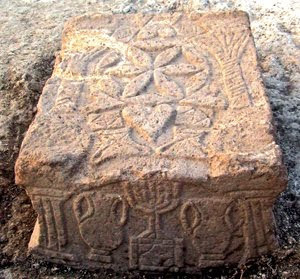 The ossuary – a stone chest used to store bones – is decorated with the stylized shapes of flowers and bears an inscription with the name "Miriam daughter of Yeshua son of Caiaphas, priest of Maaziah from Beth Imri." The ossuary was seized from tomb robbers three years ago, the government antiquities body said in a statement. Because it "was not found in a controlled archaeological excavation and because of its special scientific importance," the statement said, it has been undergoing lab tests since then. The tests, which used powerful microscopes to inspect layers of buildup on the box and inscription, were carried out by two scholars, one from Tel Aviv University and the other from Bar Ilan University, the statement said. 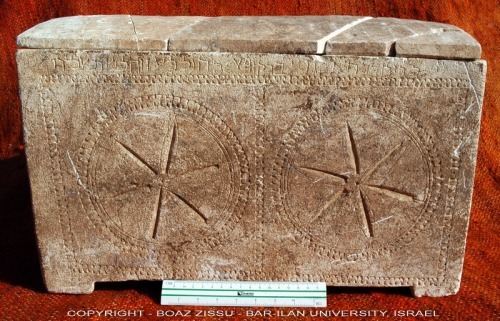 The research indicated that the inscription is "genuine and ancient." Careful tests were necessary because forgery is common in the world of biblical artifacts, where a brisk black market exists and where antiquities linked in some way to the Bible can fetch millions of dollars. A similar ossuary – bearing the inscription "James son of Joseph brother of Jesus" – is currently at the center of a fraud trial under way in Israel. The James ossuary was exhibited to widespread acclaim as the only known archaeological link to Jesus, but lab tests run by the Israel Antiquities Authority indicated the inscription was fake. An Israeli collector has been charged with forging the ossuary and other biblical antiquities, and a verdict is pending. The collector says the box is authentic. The scholars believe the Miriam ossuary was plundered from a tomb in the Valley of Elah, southwest of Jerusalem. The word "maaziah" on the inscription refers to a subset of the priestly caste. Scholars believe "Beth Imri" refers either to a priestly family or to the family's village of origin. For a while there was a debate as to whether synagogues existed in the New Testament era or whether they were anachronistically written into the Gospels and Acts. Over the last 20 years or more, however, there have been a number of synagogues discovered that can be reliably dated to the first century. Recently a new one has been discovered in the Galilee in Magdala, the traditional home of Mary Magdalene. Biblical Archaeology Review has a good article on it. I am hoping to see it this weekend. Here is a part of the BAR article. The Magdala synagogue from this time is richly decorated with frescoes of colored panels. Mosaics with geometric designs covered the floor. Impressive columns supported the roof. And a strange, nearly 3-foot-long stone block found in the center of the synagogue is elaborately carved on the side and the flat top. Among other reliefs, it features one of the earliest depictions of a seven-branched menorah.